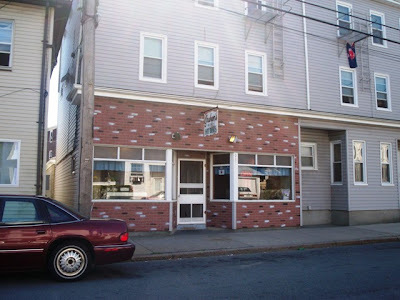 Fall River, where I reside, is reknown for it's many hot dog shops. Many of them have been around longer than I have, and that's a long time. It seems like there's a shop in every neighborhood and everyone has their favorite. I can actually see 2 from my own corner. So you can see we're a serious hot dog town. One of the oldest and most successful is Graham's and believe it or not, I've never gotten dogs from there, until now. Tummies growling ( when are they not ), Laura and I were discussing what to get for an inexpensive lunch. Hot dogs came up and so did Graham's. They have Fall River's favorite style, small coney islands in steamed buns. We decided to get 2 dogs each and to split something we'd never even heard about until recently, a hot cheese sandwich. Our good friend Michael Stern of Roadfood.com wrote about the hot cheese sandwich that he'd had recently at Graham's. He seemed to really enjoy it and we couldn't wait to try it. So around 2 p.m. Laura found herself in Graham's getting our order which we'd phoned in. 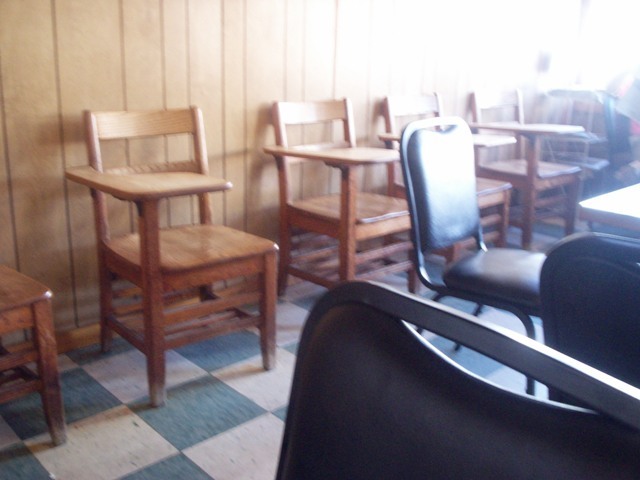 The place is a typical old school hot dog place complete with the one-armed school seats that line one wall. These things are perfect for sitting and having a couple of dogs and I think they're kinda fun. While waiting Laura found many other selections on the posted menu. Besides great coney island dogs and hot cheese sandwiches, they had chourico ( Portuguese spicy sausage ), beans, kielbasa ( polish sausage ), burgers and fries. You can get these things in all sorts of configurations, beans in the buns or on the side, fries in the buns or as a side, sausage & beans together in a bun etc. Plus you can have that great hot cheese on everything along with all the regular condiments like coney island sauce ( spicy meat sauce ), mustard, sauerkraut and chopped onions. Plus Graham's has a great special : order any 6 items ...get a 7th. free ( and that's not just on the dogs ). When Laura got back the first thing I wanted to try was that cheese sandwich. We split it in half and dug in. OMG, it was so yummy ( and very salty ). I'm not really sure what kind of cheese this is. I think it's a white cheddar but it's not slices. It's melty, hot and has a texture to it, very different. 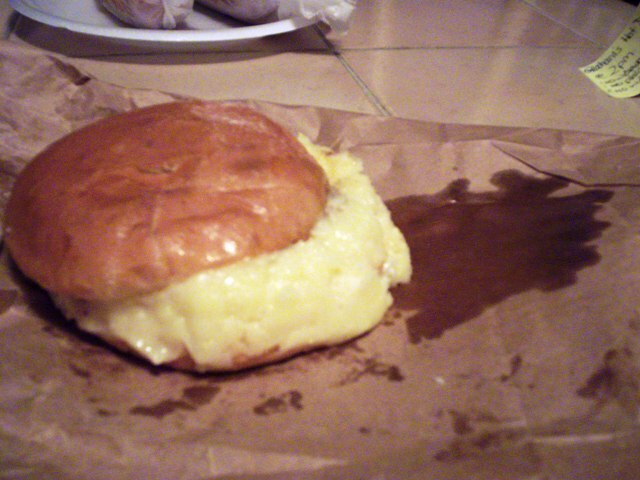 We had them also put some coney sauce on the cheese and that gave it a spicy kick. The bun was steamed warm and I was sorry we both hadn't gotten our own. I can't wait to have another. Now we dug into our hot dogs. Laura got her 2 with the works. 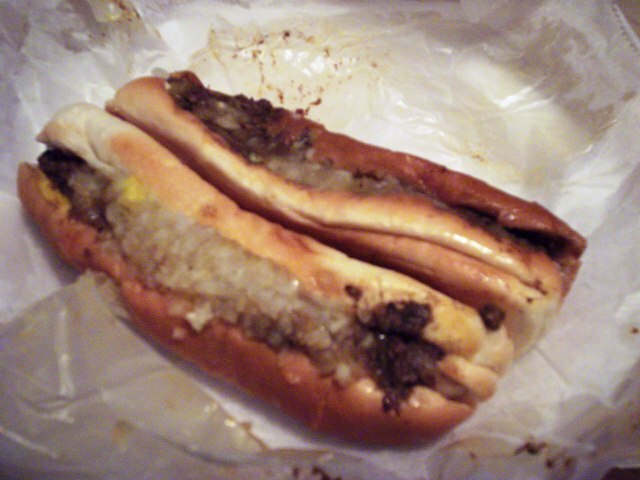 In Fall River that's coney sauce, yellow mustard, and chopped onions. She found them to be delicious. 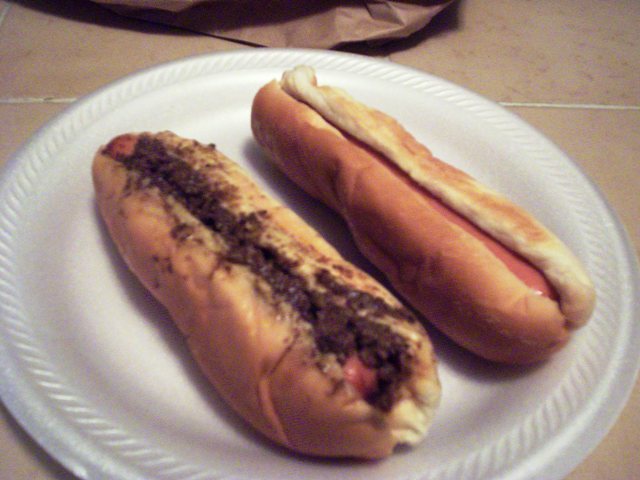 I got my usual hot dog plain ( yes, I know, I know ) and then I got very brave and had them put coney sauce on my 2nd. Guess what ? I loved it. I'd definitely get it this way again. See, I'm expanding ( and not only in the waistline ). We loved these dogs. They were very well-prepared, fresh and tasty. No wonder this place has been around forever and always makes the "favorites" lists. 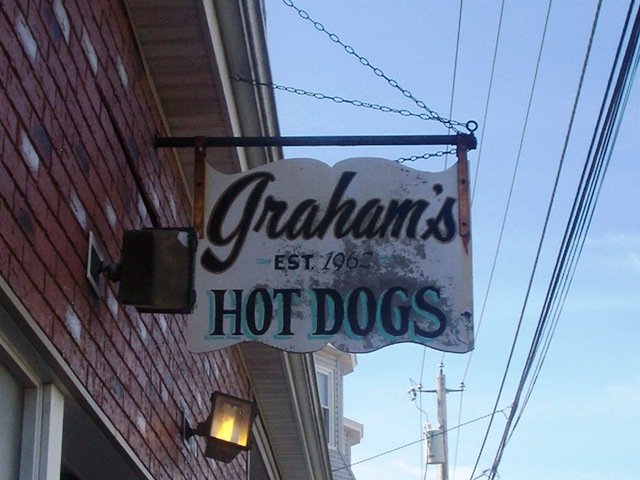 For a tasty inexpensive lunch, I heartily recommend Graham's. Our lunch today for the 4 hot dogs and 1 cheese sandwich came to $8.39. Not bad, huh ? Make sure to call ahead for their daily hours.